Nominees for the Peter Melendy Distinguished Community Builder award have made outstanding contributions to the City of Cedar Falls, voluntarily contributing time, energy, knowledge, skills and support beyond the scope of their professional practice, that has enhanced, improved or positively affected the overall quality of life in Cedar Falls. Herman C. Hemenway was such a man and is one of the recipients of the 2015 Peter Melendy Distinguished Community Builder awards. Herman Caswell (Casewell) Hemenway was born at Potsdam, New York and moved with his family to a farm near Freeport, Illinois when he was sixteen. He later taught school and studied law with Meacham & Bailey in Freeport. He was admitted to the Bar in Illinois in 1860 but soon moved further west to Independence, Iowa to establish a law practice. In 1862, he enlisted for military service and was commissioned a Lieutenant in Co. C, 27th Iowa Infantry. He was mustered out August 1865 at Clinton, Iowa. Following the war he chose Cedar Falls as his home. He was married October 13, 1868 to Lanie G. Schermerhorn, a native of Seneca County, New York. She died January 22, 1913. Hemenway and his wife had no children, but provided a home for and helped educate fourteen young people at the State Normal School. At his memorial service, Prof. Wright said: “…His domestic life was beautiful – it would have been ideal but that he was denied the companionship of children of his own. To compensate this lack, obedient to the impulses of his father-heart, he made his home a shelter, from time to time, for worthy and ambitious young women, who aspired to an education, but could not without his aid acquire it. All their needs – board, room, books, tuition, were provided at his expense. Of young ladies so helped, there were fourteen in all. In addition, the Hemenways donated the land on Clay Street between 15th & 16th Streets for a public playground. Soon after settling in Cedar Falls, in the spring of 1867, Hemenway established a legal practice in a second floor office over Frank & Herman’s Store on Main Street, where he worked as an attorney, notary public, and Bounty Pension & Claim agent. Hemenway maintained his law practice in Cedar Falls for 47 years, forming partnerships at various times with Joseph B. Powers (1867-73), Asa D. Polk, George H. Thorpe (ca. 1878), and LeClair Martin, with whom he was in partnership until he retired in 1913. But it was his involvement in and impact on the community for which he is remembered. Almost immediately after moving to Cedar Falls Herman became active with the local school board serving as secretary, officer, or director of the School District for many years. He also became active in the state Republican Party, and in 1869, was appointed, with others, to represent Black Hawk County in a Judicial Convention to nominate a candidate for District Attorney. Throughout his life Hemenway would find himself appointed to represent the community and county through his affiliation with many local groups and clubs, including the Library Association, Tuesday Club and Parlor Reading Circle. As a member of the Library Association, Hemenway donated his office space at Powers & Hemenway for association meetings. In April 1876 Governor Kirkwood appointed H. C. Hemenway as Trustee of the State Normal School. The Trustees were described as “…a notable body of men…particularly capable to successfully undertake the work of organizing a new school.” Within sixty days of his appointment, a joint meeting of the Normal School Trustees and the Orphan’s Home Board was held to take the first steps in turning Central Hall into a Normal School. At this meeting the Board elected H.C. Hemenway as President, William Pattee, Vice President, J.J. Tolerton, Secretary, and Edward Townsend, Treasurer. Professor J. C. Gilchrist of Mason City was elected Superintendent of the Normal School. The Board voted to make changes to the buildings to prepare them to open as a Normal School on September 1st, 1876. The State Normal School at Cedar Falls was formally opened on the 14th inst. The exercises were opened by a pleasant little speech by Hon. H.C. Hemenway, of Cedar Falls, followed by an elaborate and eloquent address by the principal, Prof. J.C. Gilchrist. Remarks were made by many prominent citizens, manifesting a warm and earnest enthusiasm in the new enterprise which the citizens of the little city claim as especially their own. How differently would Cedar Falls have developed had not H.C. Hemenway secured passage of the bill establishing the Normal School? If the Governor had not appointed him to the first Board of Trustees? His contribution to establishing the school was never forgotten. 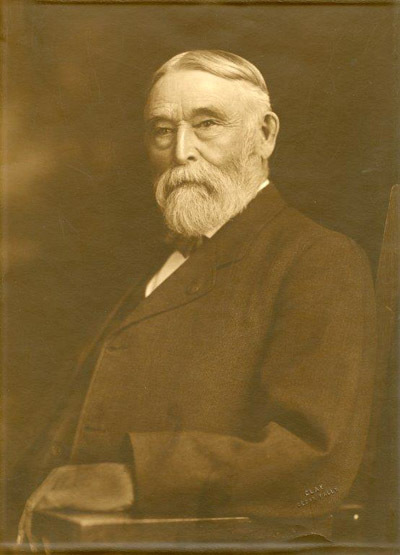 In April 1900 the businessmen of Cedar Falls gave a banquet to honor Representative C.A. Wise, Senator C. W. Mullan, and President Seerley of the Normal School for their work in securing for the Normal School an appropriation for an additional building, an addition to the support fund, and provisions for the summer school. Although he was not able to be present at the banquet, H.C. Hemenway received a “very deserving compliment” as he “was instrumental in securing the establishment of the Normal School against great odds” and for obtaining the first appropriation for the school. He was equally honored in moving tributes upon his 1922 death. In 1877 Hemenway ran for State Senator. The Iowa State Reporter said: One of the most important offices to be filled by the people of Blackhawk [sic] County next fall is that of a Senator to succeed Hon. E. G. Miller. For this position the name of Hon. H.C. Hemenway, of Cedar Falls, has been mentioned freely of late, and we believe his nomination will be generally acceptable to all sections of the county. It certainly will be to the Reporter, for we recognize in him a gentleman of worth, ability and sterling qualities. His experience as a member of the last House will be of great value to him as a Senator, and the knowledge thus obtained will place him in the front ranks among the best workers. And he is an indefatigable worker, always ready and willing to do battle for the right, and possessed of clear and well-defined opinions as to what is right. As a Senator we believe he could do more for the county, for all the interests affecting our welfare, than any other man we could send, and believing this, we shall honestly work to secure his nomination and election. Hemenway served as State Senator in the 17th through 20th General Assemblies. He resigned his membership in the Board of Trustees of the Normal School in November 1877 to accept the office of State Senator, where he served from 1878-1882. Throughout the 1880s Hemenway continued as an active member of the Black Hawk County Republican Committee and a highly sought after speaker to area clubs such as the Womens Christian Temperance Union, Republican committees, and on patriotic occasions. He was a valued member of the Cedar Falls business community, serving on the Board of the Cedar Falls Canning Company. This was an important enterprise for the City of Cedar Falls which provided seasonal work for youth and a market for area crops. In 1890 he was among those forming a new County Temperance Union, explaining that a permanent organization was needed. He said the previous “alliance had not met expectations and had been of little use in this county. The work here had been done outside that organization. There was work to do here and a vigorous organization was necessary. We need a public sentiment that will support the officers in enforcing the law.” His words resonate with energy still today. A Civil War veteran, Hemenway was an active member of the James Brownell Post 222 in Cedar Falls, serving as a delegate to national encampments and on nominating committees for organization leadership. When the financial panic of 1893 affected local banks Hemenway’s office was the site of planning meetings to strive for resolution. Hemenway was known for having decided opinions throughout his life, and his opinions were not always consistent with the majority of local residents. For example, in 1896 Hemenway advised against granting a franchise to Bert Wilder for the maintenance of an electric light plant in Cedar Falls. The voters disagreed and the franchise was approved. The following year Hemenway again took an unpopular stance, coming out against an electric street car line between the Normal School and Cedar Falls/Waterloo. In this instance Hemenway felt the students should devote their time to their studies and Normal School social activities, rather than visiting the towns. In addition, he felt if the street car line were available, students might choose to board in the town and ride the street car to school, rather than boarding on Normal Hill. This, he claimed, would destroy the value of the property in the vicinity of the Normal School. He was not, however, opposed to the improvement of the transportation system, just the Rapid Transit Company’s streetcar. In 1892 Hemenway was appointed to a committee to improve the road from Cedar Falls to the Normal School with macadamizing (compacted stone bound with tar) for ease of transportation. Hemenway served as City Solicitor from 1893-94 (under Mayor W.R. Graham), in 1896 (under Mayor Peter Melendy), and as Cedar Falls Mayor from 1903- 1905. In his memorial to H.C. Hemenway, Professor David Sands Wright shared insights into the man’s character: As a citizen, while not seeking leadership, he was a recognized leader of men. Because the people of his community trusted him, they bestowed on him the highest civic and educational offices at their command. He was strong and positive in his convictions, and on public questions, he combatively stood in season, out of season, for what he believed was right. His outspoken courage of conviction made him enemies; tho [sic] his friendships were dear and precious in his eyes, he would not compromise a principle to make or keep a friend. He was an ardent suffragist when woman suffrage was unpopular; he was an ultra-prohibitionist when prohibitionist was a term of obloquy. When he had once determined upon a belief or course of action, he maintained it to the point of stubbornness, he carried it through at any cost. In 1917 he was honored at Iowa State Teachers College when his portrait was hung in the college library by the faculty, in recognition to the valuable services he had rendered the State Normal School in its early days. Hemenway died 27 January 1922 at his home in Cedar Falls age 89 years. A tribute to his character was printed in the newspaper and a memorial service was held in the auditorium of State Teachers College, led by Professors David Sands Wright, William W. Gist, Jennette Carpenter, C.A. Fullerton, and W. E. Hays. For over fifty years Herman C. Hemenway sought to serve the community of Cedar Falls through public service, volunteer work, elected office, friendship to the needy, and his profession. He is one of the builders of Cedar Falls.